ADORED by holiday-makers and locals alike, no visit to picturesque Hamelin Bay was complete without patting Stumpy the stingray.The friendliest ray in the bay, affectionately dubbed Stumpy because it had no barb, was a hit with families and particularly children, who would stroke and feed it.That was until two young fishermen speared the creature and hacked it to pieces in front of distressed and screaming beachgoers last month. Should the fishermen who killed 'Stumpy' the friendly stingray be charged with cruelty? Stumpy was one of the oldest, friendliest and biggest of the black and eagle rays in Hamelin Bay. It was more than 1m across. Hamelin Bay Holiday Park worker Kate Silverwood said some guests had to be restrained from attacking the fishermen. "They (the fishermen) cut off the wings of Stumpy while he was still alive," she said. "People were absolutely mortified, kids were standing there crying. A lot of people have been coming here for so long and they were just devastated. "Ms Silverwood said there were about 40 people on the beach at 9am when the slaughter occurred.More than 600 people have signed a petition calling on Fisheries Minister Norman Moore to turn the area into a marine park sanctuary zone to better protect the rays. Mr Moore has declined to be interviewed on the issue. In an emailed statement he said he unaware of any move to create a fish habitat protection area to protect stingrays in and around Hamelin Bay, but would consider the issue if and when it is raised. “Like others in the community, I am saddened by the killing of Stumpy I note however, that stingrays are not protected and fishers can spear or take them by line in Hamelin Bay," Mr Moore said.“More detailed signage in the area would be a positive step to letting newcomers know about the conservation importance of the area to the community and encouraging a conservation ethos." But beach signage already urges fishermen in the area to release stingrays "carefully if they are accidentally caught while fishing".Augusta-Margaret River shire president Ray Colyer said he didn't condone the killing of stingrays and he was concerned tourism would be affected by the actions of the fishermen.A Department of Fisheries spokesman said his office would meet with the local community to discuss the matter.A statement said: "The department, when possible, discourages people from killing stingrays at Hamelin Bay. 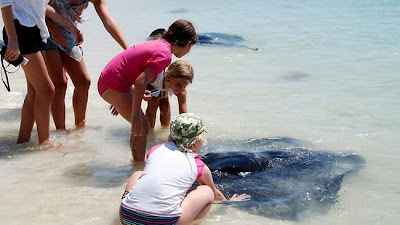 In this case, the spearing of the stingray was an unfortunate incident that occurred as a result of someone being ignorant of the history of the presence of the stingray at Hamelin Bay and the local community's attitudes and conservation values"Stingrays are not a protected species and can be speared, or taken with a line, in Hamelin Bay." Save Our Marine Life spokesman Tim Nicol said other fish were suffering because the Government had failed to introduce marine sanctuaries. "These areas should be abundant with big old fish like one-metre 80-year-old blue groper, dhufish or snapper, but these species are largely absent from near-shore waters because there's no protected areas," Mr Nicols said. Opposition environment spokeswoman Sally Talbot said the Government had dropped the ball on marine parks. "They run away from the issues where they think they can score better political points by not acting," she said.